Every air conditioning has a similar system, but there are some differences in parts and function. For example, the AC condenser is where the refrigerant begins the cooling process. The compressors, however, may vary in style and method. Traditionally, many AC systems would depend on a reciprocating compressor that uses a cylinder and piston design with many moving parts. More recently, an AC scroll compressor is becoming more popular with HVAC systems due to its reliability and efficiency. An AC scroll compressor uses two scrolls (think spiral) that work together to compress the refrigerant, which then moves it through the condenser to begin the cooling process. The first scroll is stationary, while the second scroll rotates through the coils of the first scroll creating pockets of compressed refrigerant. AC scroll compressors are designed for the highest efficiency. This is a vital difference between a scroll compressor vs reciprocating compressor. Scroll compressors achieve 100% volumetric efficiency, which in turn results in reduced energy costs. Re-expansion losses that are common from both piston strokes and suction valves are eliminated when using a scroll compressor since the design contains no pistons or valves. Altogether, the inherent design of the scroll compressor is much more efficient than the reciprocating compressor. Scroll compressors have fewer moving parts, which means less to break. For example, the scroll compressor requires no suction valves to achieve sufficient compression. This also means no heat transfer loss. Smooth operation eliminates much of the vibration associated with reciprocating compressors, making the scroll compressor less susceptible to wear and tear. 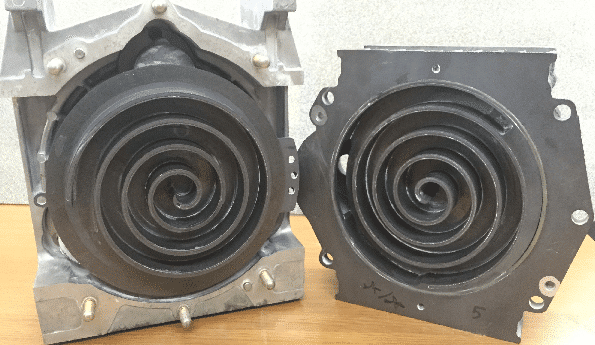 With no suction valves, no pistons, and less internal vibration during operation, the scroll compressor system has proven durability, making it more reliable than other compressor styles. This efficient design provides a significant reduction in noise – customers love the quiet operation of an AC scroll compressor. With spring just around the corner, now is the time to service, repair, or replace your current air conditioning unit. Tampa Appliance Parts has what you need to make sure your AC is running smoothly and efficiently to keep you comfortable as the weather changes. Contact us today for assistance.